Serial Ports, Printer Ports and Multiport I/O cards based on RS232, RS422, RS485 interfaces are available from Axxon Computer Corporation. As the leading designer and manufacturer of I/O Cards we offer products for the ISA, USB and PCI bus. 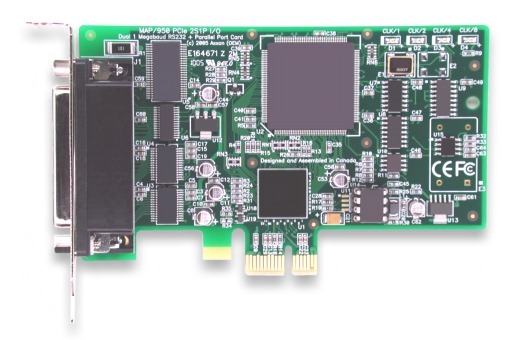 In 1993 we designed the world's first JUMPERLESS serial I/O card for the PC Market and in 1995 the first Plug and Play 16550 UART serial board and now the industry's FIRST 64-Bit PCI-X and PCI Express (PCIe) family of I/O Cards. Today we are still leading the industry by offering many state-of-the-art I/O solutions for PC market using 16550, 16554, 16654, 16950 and 16954 UARTS. Our efficient design techniques allow us to remain extremely competitive internationally with all of our innovative designs. Please browse through our website to view our latest I/O cards geared for High Speed communications. We welcome enquiries from resellers, distributors and OEMs. If you don't see what you are looking for, just email us and we will respond promptly. Take a look at some of our customers who are saying that it is our commitment to "technology that works right out of the box" that sets us apart from the competition! We also offer superior custom designed solutions and be sure to ask about our meet-comp program !